The Indala 125 kHz Standard product line is part of HID's latest line of highly-secure proximity readers. With a read range of up to five inches, Indala Standard Proximity readers are suitable for a variety of applications. These high-quality Indala Proximity Readers deliver outstanding and consistent performance with intelligent programming technology, uniform core modules, and a range of stylish bezel designs including Curve, Arch, Linear, and Wave in a variety of colors. All Indala Standard Proximity readers are available in three popular form factors: Classic, Mullion (Slim) and Wallswitch for the ultimate choice. All HID Indala 125 kHz Proximity Readers feature FlexSecur technology, which provides an added level of access system security through a verification process at the reader. A feature unique to the HID Indala product line, FlexSecur screens out unauthorized cards prior to sending access control data to the host system. Indala FlexSecur® Technology for the Industry's Most Secure Proximity Readers - Exclusive Indala FlexSecur® Password-Protected Security between card and reader screens out unauthorized cards prior to sending access control data to the host system. 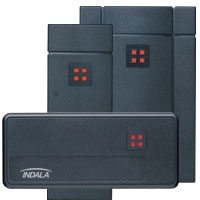 Superior Format Control for the Most Application Choices - Requirement – The HID Indala Proximity portfolio includes classic, mullion/slim, wallswitch, mid-range, long-range, and heavy-duty keypad readers for every application. Tri-State LED (red, green, amber) Configurable for single or dual line LED control. QuickFlash LED and Beep can be enabled/disabled. *Package includes Core Electronics Module and bezel. ** Dependent upon installation conditions. The Wallswitch reader is similar in size to most U.S. switch plates. Wallswitch reader can be mounted on a single gang box.